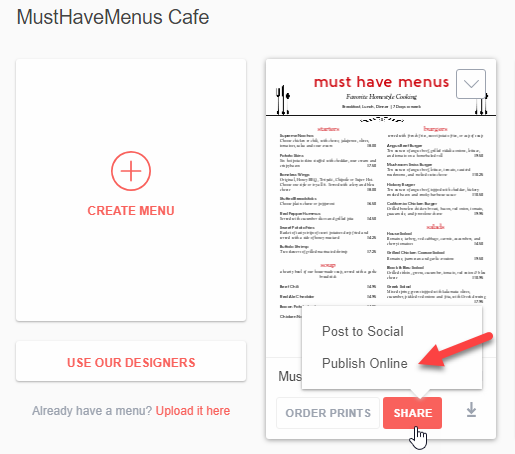 Click Search Boost and follow the prompts to publish your menu online. When the menu is successfully published, a screen will appear with publishing tools including Get Menu Code which will allow you to link or embed the menu on your website. Linking the menu will require your customers to click a link to view the menu. Simply copy the link to paste it into your website editor. Embedding the menu will place the menu in an already existing page. Click the Embed Code tab to access. 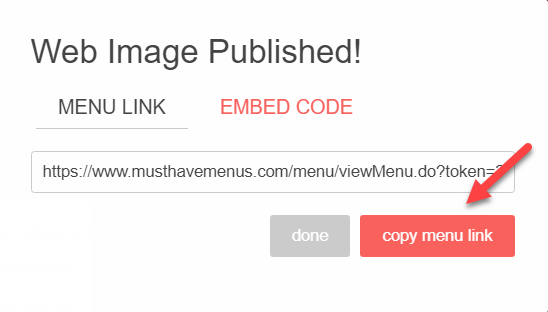 The embed code can be copied and pasted into any html-accepting field in your website builder (this may require adding an html “app” or “widget” depending on your host). Note: If you do not have control over the container size of the field into which you are placing the embed code, it may be necessary to add height and width parameters to the place_iframe div. For example, the following code adds a style attribute specifying width and height. After you've updated your menu, click the Publishing tab on the left side of My Menus to sync your updates. Recently edited menus will show the option to Sync Changes or Sync Later.